The region is strategically located along the NAFTA corridor, and is easily accessible via road or air. The region is located on Interstate 35, the main north-south interstate through Texas that extends from Mexico to Canada. In addition, the other major highways in the community include: US Highway 190, SH 36, SH 53 and SH 95. Direct access to Interstate 35 positions GRAND CENTRAL TEXAS within 180 miles of 80% of Texas’ population and allows for quick access to four of the largest markets in the nation: Austin (50 minutes south), Dallas-Fort Worth (128 miles north), San Antonio (145 miles southwest) and Houston (170 miles southeast). It has the advantages of a strong supporting infrastructure and market but without problems associated with urban environment, higher costs, too-rapid growth, and difficult construction climate. Austin-Bergstrom International Airport is located 70 minutes south of the Region. Carriers currently serving the airport include: Alaska Airlines, American Airlines, Virgin America, Continental Airlines, Delta, Frontier Airlines, Jet Blue Airways, Southwest Airlines, United Airlines, U.S. Airways, Air Canada and British Airways. ABIA currently offers non-stop service to 37 destinations. The Killeen-Fort Hood Regional Airport offers excellent commercial airline service with daily flights to and from Dallas / Fort Worth International (Dallas/Fort Worth, Texas), George Bush Intercontinental (Houston, Texas) and Hartsfield-Jackson Atlanta International (Atlanta, Georgia) airports. Carriers include American, Delta, and United Airlines and ample parking. Is critical to air travel for the Central Texas Region, offering great convenience for travelers to and from Central Texas. Service providers include American and U.S. Airways. With direct service offered to Dallas / Fort Worth International, George Bush Intercontinental. The Texas Eagle is a 1,306-mile passenger train route operated by Amtrak in the central and western United States. Trains run daily between Chicago, Illinois, and San Antonio, Texas, and continue to Los Angeles, California. The rail service takes you through major cities such as from Austin, Dallas and San Antonio. In the Central Texas Region there are stations located in McGregor and Temple. When considered in terms of ton-miles hauled per unit of energy consumed, rail transport can be more efficient than other means of transportation. Maximum economies are typically realized with bulk commodities especially when hauled over long distances. Having access to a significant rail infrastructure is an advantage that many communities will not enjoy. 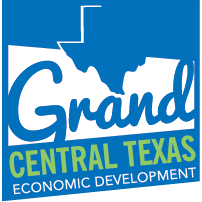 GRAND CENTRAL TEXAS is served by two Class 1 railroads; Burlington Northern Santa Fe (BNSF) and Union Pacific (UP). Rail sites are available in Cameron, McGregor, Temple and Waco. The Port of Houston is located within 200 miles of the region. It is a 25-mile-long complex of diversified public and private facilities located just a few hours by ship from the Gulf of Mexico. The port is consistently ranked 1st in the United States in foreign waterborne tonnage; 1st in U.S. imports; 1st in U.S. export tonnage and 2nd in the U.S. in total tonnage. It is also the nation’s leading breakbulk port, handling 65 percent of all major U.S. project cargo.